ISTANBUL, Turkey (Morning Star News) – After months of Islamic State (IS) committing horrific violence in the Middle East and North Africa, Palestinian Christians say a large number of Muslims in the Palestinian Territories and Israel have become “radicalized” and are much more aggressive toward them. Anti-Christian hostility boiling under the surface for years has come into plain view in the past few months in the form of physical attacks, incendiary religious speeches and inflammatory billboards, they said. Palestinian Christian leaders said not all Muslims in the Territories and Israel have become extremists, and elders within the Muslim community are trying to dampen the effects of extremist ideology, but enough Palestinians have become radicalized that many Christians feel unsafe or, at minimum, openly unwanted. Whereas tensions between Christians and Muslims previously were seen as issues between individuals, there is now a definite “us vs. them” mentality from Islamic extremists, Christian leaders said. Ramped-up hostilities from radicalized Muslims come on top of attacks on Palestinian- and Christian-owned properties by ultra-Orthodox Jewish zealots, in addition to the day-to-day difficulties Israeli officials impose on Palestinians in the Territories. Opinions differ as to when attitudes started to change in the Territories, but most agree it happened some time in 2014, either during a retaliatory military campaign by Israel against Hamas for the June 12 kidnapping and murder of three Israeli teenagers, or when the IS territorial expansion in the Middle East started in earnest. In February, Christians in Israel’s heavily Muslim town of Nazareth were alarmed to find a billboard posted downtown ordering them not to spread their faith or even talk about Jesus in a way that contradicts the Islamic version of His life. According to local media reports, area Christians are too afraid to ask to have the sign removed. None of the Christians interviewed by Morning Star News were willing to talk about the sign. That month in East Jerusalem, in the Old City area, on Feb. 26 someone started a fire at a seminary building used by the Greek Orthodox Church near the Jaffa Gate. No one was injured, and although no one was ever arrested, ultra-Orthodox Jewish groups were widely thought to be responsible. Islamist anti-Christian sentiment has not been limited to billboards. 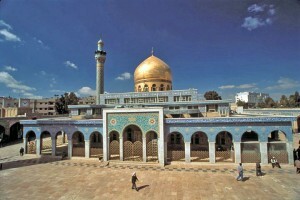 On May 1, Sheikh Issam Ameera, an imam at the Al-Aqsa mosque (built on the Temple Mount in the Old City area), posted online a video of a sermon entitled “The Islamic State is the keeper of religion and state” in which he essentially told fellow Muslims that they must be in a constant state of war and conquest against the “polytheist enemy”, i.e., Christians, as well as against Jews. Ameera repeats that “polytheists” are enemies that must be fought with Allah’s help. Three days later, a disagreement between a Christian and a Muslim in the Old City escalated into a mob attack against Christians. According to several witnesses, 60 to 80 Muslims in their 20s rampaged through the Christian Quarter immediately after the argument, throwing stones at houses and businesses. The young men also attacked an area Ethiopian Orthodox Monastery, where they spray-painted anti-Christian messages on the building and destroyed a cross. There is some debate as to what is causing the change in attitudes of Palestinian Muslims toward Palestinian Christians, particularly those of Muslim youth in the Territories. Christians are asking how far IS ideology has penetrated Palestinian society. Has IS arrived in the Territories, or are the anti-Christian attitudes there the natural outcome of other radical Islamic groups in the region since 1980s? There is evidence for both theories. The IS graffiti, scrawled word for word in the Christian quarter from the video of the slain Ethiopians, is thought to show that some Muslims are embracing IS ideology or, at minimum, are being influenced by it. Hizb al-Tahrir, an Islamist party in Palestine, has placed a recruiting billboard between Jerusalem and Ramallah inviting Muslims into IS and its caliphate. Ameera of the Al-Aqsa mosque is a leading member of the same party. On May 11 the Islamic hostility appeared to be mitigated when a traditional elders council between Muslim and Christian leaders took place in Jerusalem. According to every Christian interviewed, the Muslim leaders apologized earnestly for the actions of those who attacked the Christian quarter. One Christian leader said they appeared to be almost shamed by the actions of the mob, which may show that the majority of Muslims in the Territories are tolerant towards the Christian minority. The group issued an “honor pact” in which further attacks were foresworn. But on May 24, Muslims attacked another group of Christians near the Damascus gate. Details about the attack are scarce, other than that one man was slightly injured and that Israeli police broke it up. Fellemon said that although he thinks IS may have some influence in the Territories, the terrorist group is a part of the larger problem of militant Islam in the Territories and not the other way around. Another Christian leader said recent hostilities in Jerusalem could be the related to IS. The Christian leader said the hostilities call for prayer in the Territories.